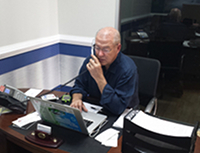 At SignWorld, we specialize in visual solutions and work hard to exceed our customer's expectations. We have the experience necessary to deliver high quality custom graphic solutions suited to your specific needs. The wedding signs looked amazing and matched our colors perfectly. Thank you so much! We use SignWorld every time we need a banner or sign and they never disappoint. We highly recommend. Nestled in the heart of Auburn, Sign World has grown with the diverse and ever changing landscape of the Loveliest Village on the Plains. 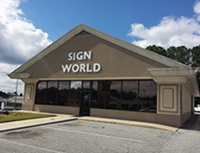 A family owned company with fair and competitive business practices, Sign World is the area’s most recommended and respected sign manufacturer. Our mission is to provide quality products, skills, and labor to our far-ranging variety of customers. From the very complex to the most simple of projects, each customer is given the same attention and respect that they have come to expect from our trained and knowledgeable staff. With almost 30 years in business, we are a solid pillar in our business community. We have a heart to serve and provide great service to our clients. Let us know how we can help you become part of our growing family.